Settlement of Asiago - Theories about how Asiago was settled. In the mountains to the North of Vicenza (Northwest of Venezia), in a valley surrounded by forests and evergreen trees, is a little district of Asiago, inhabited by a Teutonic colony known under the name of the "Sieben Perghe", "Spettabile Reggenza dei 7 comuni", or "Sette Comuni". With the addition of Conco in 1796, there are now 8 comuni in L'Altopiano, so the Sette Comuni" has become the "Otto Comuni". This community is in the province of Vicenza, in the Veneto Region of Italia. The district which they occupy, is an area of 86 square miles. The territory is known as the Pre Alpi Venete. It contains 7 burghs, 24 villages, and a population of about 25,000. It is almost entirely mountainous, with it's boundaries being the Brenta on the East, the Astico on the West, the Tyrolian Alps on the North, and to the South it has volcanic hills extending from Marostria to Caltrano. L'Altopiano was first inhabited by bronze age hunters. The remains of their huts were found in the 1960's by a group of archeologists from the university of Padova. The huts are in the periferical area of the Altopiano, precisely in Lusiana - Conco area and the Rotzo township. The first documented signs of the existence of stable habitants of the Altopiano id in a document dating 936 in which Berengario, the Longobard king, gives the entire Altopiano to the Bishops of Padova. The archdiocese of Padova has always been very powerful and rich, it still is today. The bishops of Padova seeing that the area was scarcely inhabited and needing the land fruitful began inviting German peasants, from the Bavarian Alps, to settle the Altopiano. This immigration began around the year 1000 and continued until the XIV century. This is where the cimbro language began taking foot in Asiago and the Altopiano. 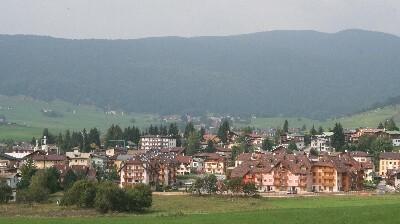 Asiago is the principal town of the “Seven Communes” on the historic Asiago plateau (L'Altopiano). The oldest villages of the plateau were Rotzo and Enego. 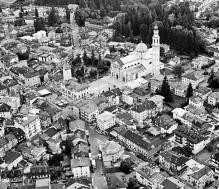 As settlers moved toward the center of the plateau, the villages of Asiago, Lusiana, Gallio, Roana, & Foza were founded. Today there are actually eight comunes as Conco was added recently. In the 19th Century the area was divided between the Kingdom of Italy and the Austro-Hungarian Empire. Each community, by boundary and imperial policy, took on a more Austrian or Italian identity. To make matters worse, modern warfare viewed the Altopiano as an avenue of invasion, as opposed to ancient routes along the Adige or Brenta River valleys. Both nations built a string of modern fortresses across the plateau. The Austrian Emperor Franz-Josef called his forts "the iron girdle." These structures were not the outdated brick, earth and stone forts of France or Belgium, hastily reinforced with a concrete shell and iron turrets. Both Austrian and Italian forts were modern, of solid concrete, reinforced with iron, incorporating the latest military technology. The first shots of the war between Austria and Italy were fired on the Altipiano. The Austrian forts proved their value in withstanding every Italian attack. Asiago, and most of this Trentino highland, were overrun by the Austrians twice, in the Spring Offensive of 1916 (known as the Strafexpedition or punishment war'') and the Fall Offensive of 1917. The Austrians never once broke out of the confines of the Altipiano onto the open plains of Veneto, due to fierce Italian resistance, the rough terrain and an influenza epidemic in the Austrian ranks during the Winter of 1917/18. During the period under Austrian rule, a large amount of emigration took place in the Altopiano. It happened again in the early years of the Fascist Regime of WWI. The sheer destruction of this war, and opposition to the regime, caused an exodus of many inhabitants to countries where work was more plentiful (.i.e. United States, South America and Australia). 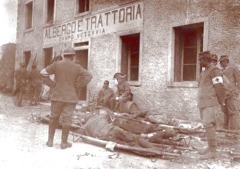 WWI was the most significant historical event to take place in L'Altopiano. Much of the war was fought in the area mountains. Looking down from above the timberline, the scars of trenches and shell holes can still be seen below. The fortresses were for the most part demolished (for iron) during the impoverished Thirties- destroyed more by scavenging than war! The Sacrarium, unveiled in 1938, is the tomb of over 54,000 identified and unknown WWI Italian and Austro-Hungarian soldiers (12,795 identified, 21,491 unknown soldiers, 19,999 Austro-Hungarian). As with all ossuaries in Italy, Il Sacrario is being added to yearly, as hiker, farmer and forester find new remains. By the end of the 1920's, emigration was no longer possible, with the frontiers of many nations closed and the world in the grip of an economic crisis. Life in the area became even harder near the end of WWII. It was not until the 1960's that the local economy recovered, due to the development of tourism. Today, Asiago is a well-known summer and winter holiday resort. There are at least two theories prevalent regarding the settlement of the region by the Cimbri. It is known that from at least 200 BC the Cimbri lived in the northern parts of Jutland/Denmark. The town of Aalborg and adjoining areas have evidence and artifacts supporting this fact. The Roman historian Pliny the Elder also refers to that area as the land of the Cimbri. The historian Tacitus also mentioned a people bearing the name Cimbri who sent ambassadors to the Roman emperor Augustus. Probably due to climatic changes and great floods, the tribes migrated south into Europe, together with neighboring tribes of Teutons, sometime around the year 130 BC. Indications are that their travels took them through Bohemia to what is now northern Yugoslavia, then turning westward through Austria, Bavaria into eastern France. These journeys correspond quite closely to the river valleys of the Elbe, Danube and Rhone. They reportedly defeated Roman armies in battles at Noreia near the present town of Ljubljana and then again at Orange in the Rhone valley. In 101 BC the Cimbri were annihilated by the Roman general Gaius Marius in the Po valley of northern Italy, perhaps near the present city of Vercelli. One theory holds that the few survivors took refuge in the mountains and plateaus of northern Italy. This raises some question, however, in that Roman writers report that the women killed themselves and all their children in the aftermath of the total defeat by the Romans. In the 8th century there was a population explosion from Jutland. Frederick was the King of Denmark. In the year 1000, the Bishop for L'Altopiano invited the Germans from Bavaria. Other ancient documentary evidence supports the theory that the area was settled by Cimbri descendants during large southern migrations from areas around Bavaria in the 11th/12th centuries. One indication is a document showing that in 1287 the prince bishop of Verona, Federico Vanga (the German Friedrich von Wangen) was petitioned by Bavarian neighbors to settle in the territory of the Lessinia hills. These people were called "tzimberer", from which the word "Cimbri" is speculated to have been derived. Another theory holds that the Cimbri may have entered the area through the Brenner Pass during their nomadic wanderings before the time of Christ. Perhaps each of these theories has some legitimate credibility. Sometime during the 12th and 13th centuries, the various settlements in the Veneto mountains formed themselves into self-governing federations. 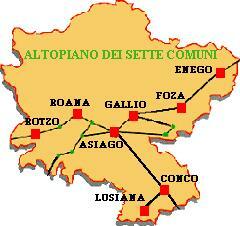 These were the 13 communes in the northern Verona Hills and the 7 communes in the Asiago plateau. Both groups formed loose alliances with the city of Venice mostly for trade purposes. The Sette (7) Comuni federation is known to have been fully organized between the years of 1270 and 1339 but the Document of Federation was destroyed in fires due to hostilities circa 1500. The federation lasted until the Napoleanic invasions circa 1807. The territory was under Austrian rule from 1815 to 1866 and became a part of Italy by international accord in 1866. For more on the Cimbri, click here. Towards the middle of the 1300's the altopiano comunity decided to give itself a sort of government to handle various problems that the enlarged comunity posed. each comune would have a representative in the council. the representative would be voted on each year by the head families that composed his comune. A representative could not be revoted in two following years, that is between his reelection at least a year would have to pass. The council met once every 15 days in Asiago, the reggenza building was where the pastor's house is now. In these reunions every aspect of the altopiano life could be discussed; building a home, where to cut wood, where the animals could pasture, passing rights, taxes and especially making contracts with the farmers in the plains to pasture the sheep in the winter time. 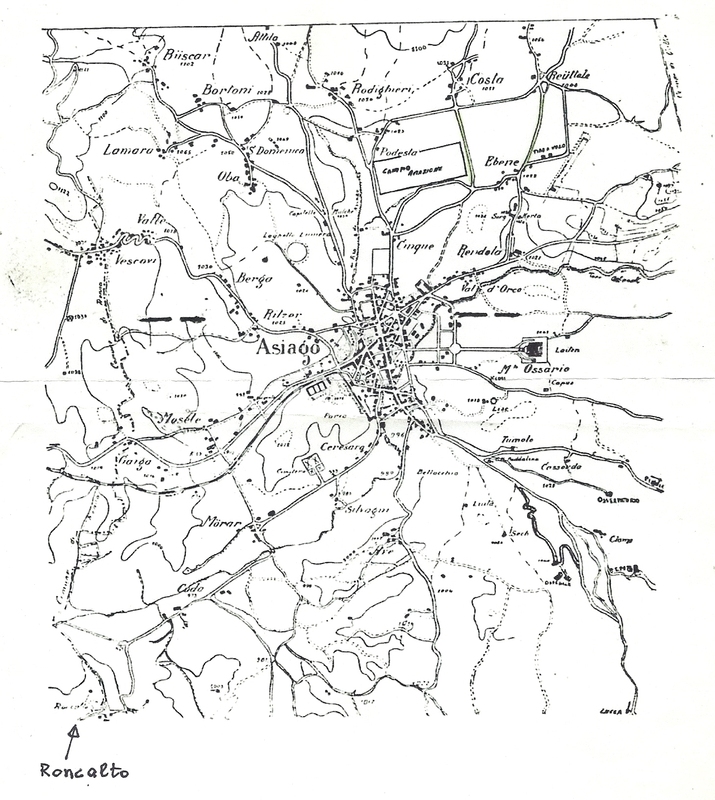 Getting back to the Spettabile Reggenza, this form of government also had legislation on the land, even today most of the altopiano territory is not privately owned but is property of the people (this is called usi civici). Each Comune had the direct right on it's territory (thru the power given it by the people) and the other Comunes had to pay a transit tax to pass thru the other Comune's territory. On this point a curiosity: Asiago, to get it's lumber to the Brenta river where it would be sold, had to pass thru Gallio. Not wanting to pay, asiago built a stone cut stairway made of 4444 stairs to bypass Gallio. The stairway is calles the Calà del Sasso and should still be in the Guiness world records as the longest stairway. In 1406 the political scenario in the area was quite difficult. The warlord Ezzelino died and his various territories (Bassano and Marostica all the way to Vicenza) began fighting to conquer the most land. The altopiano found itself in the middle of these conflicts and not having a powerful army decided to find protection under Venice, the Serenissima. Seven representatives of the Altopiano, one for every township, went to the doge (the ruling figure of Venice) and promised Venice the first pick on the wood and agricultural produce in change of protection and independence which meant no taxes owned and no military service; only obligation was to defend the northern boader and to not sell wood or food to Venice's enemies. This accord lasted until the end of the 1700's when the Venice lordship finally passed from being after having been defeated by the french and austrian alliance. Another curious note, in the famous battle of Lepanto, where the venitians defeated the turkish navy a boat was built, furnished and manned by altopianesi, For their courage and their dedication Venice gave the altopiano a flag, considered a great honor, which is still visible in the Asiago town hall. The Spettabile Reggenza remained in power for over 500 years maintaining it's independence through all the difficulties in that period with powerful nation states pressing on it's boarders. 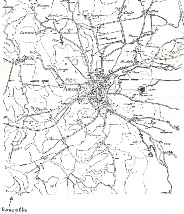 When napoleon defeated Venice he first imposed a census of the altopiano to better tax the area. Here is when last names became obligatory and the various families began calling themselves Rigoni, Cunico, Rodeghiero, etc. Finding many difficulties in relating woth the altopianesi, remember they spoke a german dialect even if at that ttime the venitian dialect was spoken and began infiltrating the original language. Napoleon, to rid himself of the altopiano, gave the area to the Austrian king thatm in turn, passed the administration of the altopiano to the bishop prince of Trento. The ruler of trento had wanted the altopiano, for it's rich pastures, for time unknown and he immediately began taxing heavily the population to bend the proud altopianesi to his will. When the altopiano didn't pay the taxes he demanded he sent prince maxamillian to invade the land. Maximillian set off, 3000 soldiers strong, to bend the altopianesi, these, instead of bending their heads, affronted maxamillian creating manmade landslides in the Enego area that decimated his troops. Maxamillian pushed on and conquered Enego. He then began pushing towards Asiago. On his way, on the Asiago Gallio boundary, he met up with a powerful resistance. The altopianesi fought him for various days until they were forced to retreat but maxamillian troops were now down to less than a 1000. Another note: The altopianesi that fought Maxamillian's troops on that boundary were considered hero's by the altopiano than gave them the honor be called, even today, with the last name Forte, that is strong. So any Forte is a decendant of one of those valiant fighters! 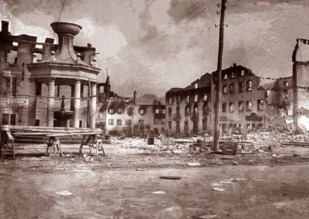 Maxamillian burned most of Asiago to the ground finding it completely abandoned by its habitants. The asiaghesi had run to Rotzo, that is way many asiago last names are found also in Rotzo. No people, no taxes. Maxamillian returned to Trento in shame and the bishop prince no longer wanted anything to do with the Altopiano. The altopiano lived in this conquered, not conquered situation until 1860's when the italian people began dreaming of a nation of their own. This period, from the end of the Serenissima in 1767 to the unification of the Veneto Region to Italy in 1867, was not a good one for the altopiano, surrounded by city states that had no fondness for them and so the altopianesi couldn't sell their produce. In this period the first emigrations began. The altopianesi began going to austria, germany, the united states (even fighting in thr civil war), to prussia. The dream of an italian nation was taken on enthusiastically by the altopiano that had an important part in this new movement called the Risorgimento. Da quando la Corte di Cassazione ha deliberato a favore del referendum pro Trento, la questione è oggetto di dibattito in tutte le piazze dell’Altopiano. Chi si dichiara a favore, chi contrario: ognuno porta avanti i suoi ragionamenti che troppo spesso, si soffermano solamente sulla questione economica. Per quanto possa essere un punto importante, non è certamente quello preso in considerazione dalla Corte di Cassazione e neppure dal movimento referendario. Le ragioni che hanno spinto la Cassazione a dare l’ok al referendum sono di natura natura storica ed etnica, tra l’altro sono le uniche motivazioni ritenute valide dalla legge per cambiare regione. «L’antico tedesco fu parlato dalle nostre genti fino alla prima guerra», spiega Francesco Rodeghiero, coordinatore del movimento. Che continua: «È dimostrato che la gente dell’Altopiano è di origine germanica. Dall’anno mille emigrarono dall’odierna Baviera, chiamati dai frati benedettini, per rendere produttive le terre dell’Altopiano, a quel tempo ricoperte da fitti boschi. Una migrazione che è proseguita fino al 1350. Intorno al 1200, poi, i Sette Comuni si unirono in Federazione con un proprio governo democratico». Fatti storici, dimostrati da studi sulla lingua cimbra e da documenti conservati negli archivi di Vicenza e Venezia. Altrettanto vere però sono le numerose testimonianze storiche delle dispute tra le genti dell’Altopiano e le popolazioni trentine. Nel 1750, la Conferenza di pace di Rovereto, che si concluse con la posa di numerosi cippi per segnare i confini sulla piana di Marcésina, ha cercato di porre fine a «lunghi secoli di contese tra l’Altopiano, suddetti fedeli della Serenissima, e gli abitanti del Trentino, sudditi cesarei sotto la signoria dei Principi - Vescovi di Trento», come descritto nel libro di Ivone Cacciavillani “I Cippi della Marcésina”. Già nel 1496, l’ambasciatore della Serenissima alla corte dell’Imperatore Massimiliano, Francesco Foscari, parla nei suoi dispacci delle scaramucce «frequenti e talora asprissime» tra i montanari altopianesi ed i valligiani trentini. Domenico Sartori, nella sua “Storia della Federazione dei Sette Comuni Vicentini”, scrive di «sistematiche ruberie e soprusi a danno dei Sette Comuni» nel periodo tra il 1524 ed il 1605. Il paese di Rotzo, per cercare di mettere fine alle continue incursioni nei suoi territori da parte dei trentini, si accordò con Levico per la spartizione delle montagne delle Vezzene. Anche Vicenza città cercò di imporre la sua sovranità sull’Altopiano, non riuscendoci, quando i possedimenti di Ezzelino III furono divisi tra quelle città vittime delle sue scorrerie. «Non credo di offendere nessuno affermando che gli altopianesi si considerano altopianesi e basta - afferma Emanuele CUNICO, storico asiaghese -. L’Altopiano, nel 1404, ha fatto la dedizione spontanea alla Serenissima per sfuggire ad un periodo d’instabilità politica, quando le Signorie erano in perenne lotta tra loro. Venezia, oltre a proteggere l’Altopiano dalle prepotenze delle Signorie, assicurava un’autonomia alla popolazione altopianese esentandola dai dazi sul commercio di lana e legname. Oggi servirebbero interventi sul turismo e sui servizi. Se la Venezia di oggi avesse l’attenzione per l’Altopiano che aveva la Venezia di ieri, non credo che il cambio di confine avrebbe più alcuna attrattiva». Asiago (lingua cimbra: Sleghe, ted. : Schlege) è il comune capoluogo della Spettabile Reggenza dei 7 Comuni. I primi insediamenti umani risalgono al periodo paleolitico e mesolitico e i primi abitanti stabili appartengono all'epoca preromana. Nella lingua e nella tradizione cimbra, sono stati rilevati anche indizi che sono ricondotti ai Goti o ad altre popolazioni “barbare”, quindi un'influenza longobarda. È invece ormai certo che dalla Germania meridionale sono scesi, intorno e particolarmente dopo l'anno Mille, dei gruppi provenienti per lo più dall'area linguistica bavaro-tirolese e forse in parte anche dalla Danimarca delle famiglie in cerca di terre da coltivare che raggiunsero l'Altopiano e qui si stabilirono colonizzandone il territorio, portando i loro costumi e la loro lingua, il cimbro, parlata da alcune persone ancora oggi. Dal 1310 al 1807 si costituì uno dei primi governi autonomi e democratici della storia, la Spettabile Reggenza dei 7 comuni, con moneta e milizia propria. Agli inizi del XIII secolo gli insediamenti tedeschi, che daranno in seguito vita ai Sette Comuni, dovettero organizzarsi militarmente per difendersi dalle mire espansionistiche dei vicini; come il potente signorotto di Castel Ivano della Valsugana e in questo, trovarono l'appoggio di Ezzelino III da Romano. Tra il 1036 e il 1260 i comuni dell'Altopiano (Asiago, Enego, Lusiana, Gallio, Foza, Roana e Rotzo), si alleano fornendo le migliori truppe all'esercito del ghibellino Ezzelino III. Il 29 giugno 1310 venne definito lo statuto della Spettabile Reggenza dei Sette Comuni; l'insegna che lo sosteneva e guidava recitava: “Dise saint Siben, Alte Komeun, Prudere Liben”, Questi sono i Sette Antichi Comuni, Fratelli Cari. Nel 1327 la Federazione dei Sette Comuni, pur mantenendo la propria autonomia amministrativa, passò sotto l'ala protettiva degli Scaligeri di Verona. La Reggenza nel 1387 passò sotto la protezione dei Visconti di Milano, che ne rispettarono lo statuto, ne assicurarono l'autonomia amministrativa, ne riconobbero le esenzioni e i privilegi, denominò gli abitanti dei Sette Comuni “i tedeschi delle montagne del distretto di Vicenza”. Il 20 febbraio 1404 secondo il calendario Veneto, il 1405 secondo quello attuale, la Federazione dei Sette Comuni fece uno spontaneo atto di dedizione alla Repubblica di Venezia, che con la decadenza delle signorie degli Scaligeri e dei Visconti allargò il suo dominio nella terra ferma. Non fu un atto di sudditanza, quanto piuttosto di un patto che permise ai Sette Comuni un certo sviluppo economico e democratico, favorendo la produzione e il commercio del legname, del carbone, della lana, dei formaggi, dell'artigianato. L'organizzazione interna delle comunità locali fu in genere lasciata all'iniziativa e all'autodeterminazione della gente dell'Altopiano. La comunità costituiva delle frazioni identificate col cognome dei residenti, tutti imparentati tra di loro, in cui ogni decisione veniva discussa in un'assemblea dei capifamiglia che eleggeva tra i suoi membri i governatori del colonnello. I governatori eleggevano a loro volta i deputati per l'amministrazione del comune, che nominava uno o due rappresentanti a formare il consiglio della Reggenza. Con la rivoluzione francese e le vittorie di Napoleone, nel 1797 la Repubblica Serenissima di Venezia cadde e con essa pure la Spettabile Reggenza dei Sette comuni. Bastianelli, Bertacchi, Boeme, Ciscati, Costa, Pizzati, Pisoni, Schiani, Rubbio, Berti, Brombe, Mori, Rubbietto, Spelonchette, Colpi, Miozze, Pile, Stingari, Tortima, Topi, Alto, Bielli, Boffi, Busa, Ucchese, Cunchele, Corame, Brunelli, Caselli, Miozze, Bisacca, Cortesi, Gonzi, Moltrina, Muri, Nogara, Oneste, Orni, Rovera, Sandrini, Segala, Xilli, Bagnara, Ronchi, Lazzera, Lupati, Pologni, Stevan, Fratte, Giare, Monte Cogolin, Puffele. Cornetta, Coste di qua, Coste di là, Valdifabbro di qua, Valdifabbro di Là, Valgoda, Valdicina, Dori, Frisoni, Godenella, Godeluna, Lessi, Cappello, Coldarco, Frizon, Giardinetto, Madonnina, Piovega di Sopra, Piovega di Sotto. lazzaretti, Guzzi, Catagni, Stainer, Carpanedi, Ori, Chiomenti, Reiteie, Ciepa, Ronar, Valcapra, Polinti, Trolli, Ghigner, Contri, Tesser di Sopra, Tesser di Sotto, Labentall, Stona, gechelini, Durrench, Martini, Alberti, Cruni, Ravanelli. Zingar, Groghi, Valle dei Ronchi, Schivi, Sambugari, Ronchi, Dalla Bona, Bonur, Gianesini,Bertigo, Sisemol,Stellar, Ferragh,Rotz,Costa, Leghen Zebbo. 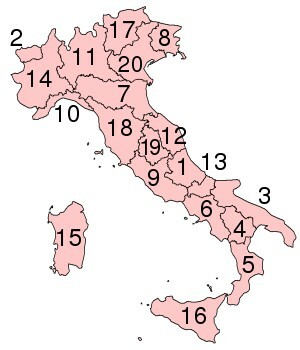 The Veneto is one of Italy's 20 regions, and consists of seven provinces, as shown on the map at right. It encompasses a vast variety of terrain - from the lagoons of Venice and the waterways of the Po River Delta to the pre-Alps, high mountain plateaus, and the spectacular Dolomites - covering 7095 square miles (18,376 sq km), or about the size of the U.S. state of New Jersey. Its population is approximately 4.5 million, and the products produced here include textiles, chemicals, paper, processed foods, wine, machinery (DeLongonghi), eyeglasses (Luxottica), gold jewelry, shoes, furniture, and apparel (Diesel, Benetton). Even the word "ciao" is a product of the Veneto, originally meaning "your slave" (in the sense of "at your service") in Venetian dialect. 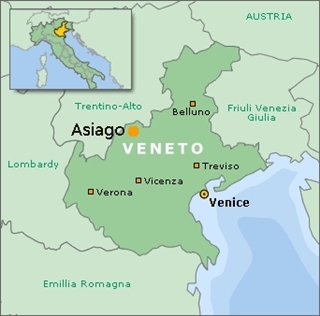 The Veneto officially became part of Italy in 1866, after having been ruled by the Romans, the Lombards, the Venetian Republic, Austria, and the Napoleanic kingdom of Italy. Scroll down to see a complete list of regions and provinces. 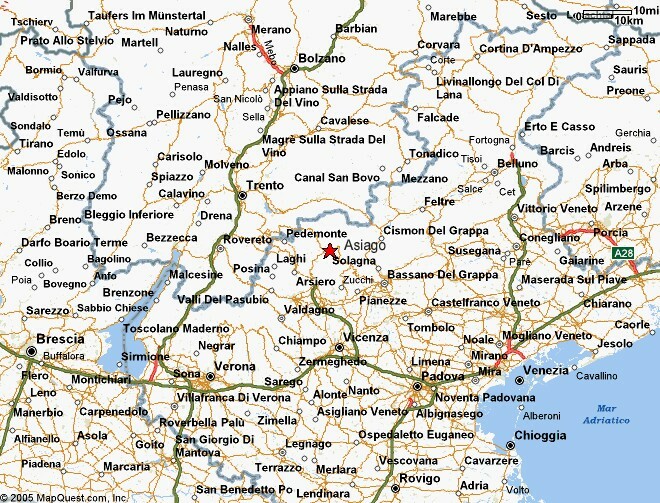 The Province of Vicenza has a surface area of 272,220 square km with a total population of about 770,000, and is administratively divided into 121 Municipalities. The northern parts of Veneto and adjoining regions, mainly the mountainous areas and foothills, are known as the land of the "Cimbri", one of the very ancient Germanic tribes of Europe. The Cimbro language is still spoken by a relatively few in limited areas of the regions and a few Cimbro words are sometimes found in the local Italian dialects. One source reports that approximately 2,000 people are still fluent and that three very distinct dialects are prevalent --- Lusernese Cimbrian in the hills southeast of Trento, Tauch Cimbrian in the Giazza area northeast of Verona and Common Cimbrian in the Altopiano d'Asiago towns of Roana and Rotzo. Check out the town of Cunico, Italy here.